How did your elected officials score? Two weeks after former U.S. Senator Jeff Sessions (R-AL) was confirmed as the U.S. Attorney General, Sessions’ score of 0% on the League of Conservation Voters’ (LCV) 2016 National Environmental Scorecard offers insight into what his priorities may be in his new role. Sen. Richard Shelby and former Sen. Jeff Sessions each earned a score of 0% by voting against clean water, energy efficiency, and public lands. Both senators voted to void the Clean Water Rule that protects the drinking water consumed by one in three Americans. Sessions also voted for a bill that would have gutted the Antiquities Act, a key piece of legislation that is used to preserve public lands from the Statue of Liberty to the Grand Canyon. LCV’s 2016 National Environmental Scorecard publishes the environmental voting record for each member during the second session of the 114th Congress. This year, a record-breaking 38 House votes are included in the scorecard. The Alabama congressional delegation’s scores are being released by Conservation Alabama in partnership with LCV. The full scorecard is available in English and Spanish here. Once again, Rep. Terri Sewell (D-Birmingham) maintained her position as the highest scoring member of Alabama’s delegation by voting to protect the laws that safeguard our drinking water and public lands. The remainder of the state’s delegation in the U.S. House of Representatives scored no higher than 3%. We know you’ve been spending the last few months anxiously awaiting the climax of the legislative session as you’ve been talking with friends and family about the intricate differences between the Compressed Natural Gas Vehicle Tax Incentive, the Hybrid Vehicle Tax Incentive, and the Alternative Fuel Vehicle Tax Incentive bills and the likelihood that they’ll be… What’s that? Oh, you have a life and more important things to do? Fear not, below is a quick recap of the fate of conservation-related legislation. Perhaps the biggest win for land conservation came from legislation that provides incentives for…wait for it. Development. Odd, right? The catch is that it’s development of historic structures, which are typically in downtown areas or older, more walkable neighborhoods. As demand continues to increase for residential space in urban areas, developers have had a growing incentive to focus their attention on redevelopment of existing structures. The tax credit will direct resources back towards existing infrastructure and away from new neighborhoods built on natural, undeveloped land. Another piece of legislation that will help direct resources to existing neighborhoods involves granting more local control to municipalities under the state’s land bank authority. Currently, local governments have very little power over tax-delinquent, abandoned properties, which leads to vacant structures and overgrown lots that create safety and sanitation issues for residents. Now cities will have more control to remove legal obstacles for redevelopment of the properties or may choose to use them for other community purposes, such as neighborhood gardens. Sometimes the bills that don’t pass benefit preservation and restoration efforts as much as ones that make it to the governor’s desk. One example from this session was a proposal to use future settlement funds related to the BP oil spill to repay past borrowing from the Alabama Trust Fund. While repaying what you borrow is certainly admirable, doing it at the expense of coastal communities that suffered devastation probably isn’t the best way to go. With no support from senators representing the areas affected by the spill that are due a larger proportion of the settlement funds, the bill failed to pass the Senate. Another failed piece of legislation involved an ill-conceived effort to prohibit using green building standards (read: LEED certification) for public buildings. The proposed ban was a result of LEED standards for timber products, which just so happen to differ from other commonly used standards in the state. How much does timber certification factor into the 110-point LEED grading system, you might ask. It affects a single point. One. Fortunately, the legislature determined forbidding governments from seeking the popular LEED certification based on qualms with how they rate one point was a bit of an overreaction. Last, and least on numerous levels, perhaps the biggest disappointment of the session involved the passage of HB181, which lowers the fees for toxic waste disposal at the Emelle landfill in Sumter County. Governor Bentley signed a moratorium on permitting new landfills in 2011, which the legislature later affirmed, because he recognized our policies were turning the state into the dumping ground for the rest of the country. While state departments are currently studying how to most effectively use our existing waste and prevent unnecessary outside waste from flooding our landfills, the legislature decided to provide further financial incentives for more waste to come in. And it ‘s worth repeating that this isn’t just household garbage they want to bring in. It’s toxic waste. Many positive bills, such as improved bike safety regulations and a proposed Energy Star tax holiday failed to gain approval, but will likely see life again next year. Conservation Alabama will be in Montgomery advocating for those bills and others that protect the health of Alabama and Alabamians, and we look forward to working with you on making our state a healthier place to live. 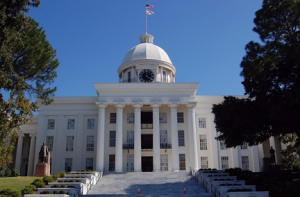 As they say, you can count on three things in Alabama; death, taxes, and an entertaining legislative session. Unless, of course, you want to bury some toxic waste. Then we might just give you a pass on the taxes.